Time goes by and the YaST wheel keeps rolling. So let’s take a look to what have moved since our previous development report. Network installation media for Tumbleweed or Leap only work properly with the exact repository they have been built for – which for Tumbleweed may mean they could be outdated after just one day. 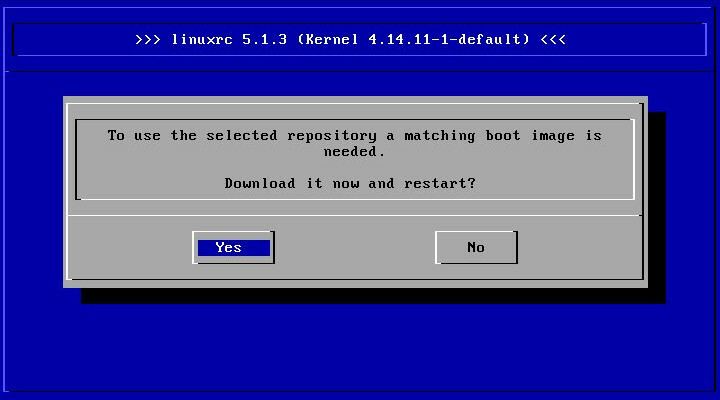 Technically, what’s done is to download a new kernel/initrd pair from the repository and restart the installation process with them (using kexec). So be prepared for a slight déjà vu. 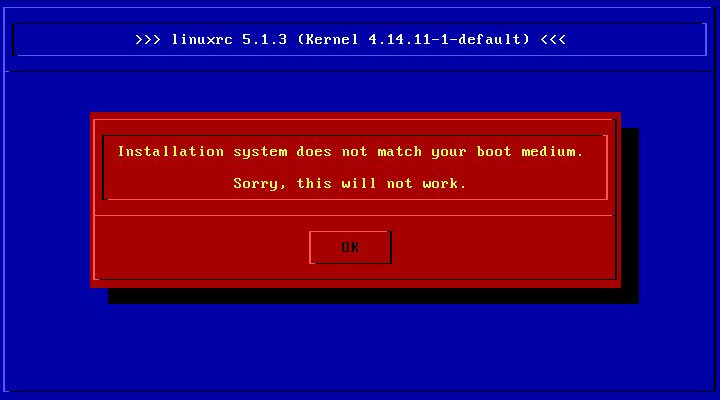 This feature is controlled by the kexec boot option. But that’s not the only news we have about openSUSE Tumbleweed. Our usual readers already know about Storage-ng, our effort to rewrite the whole YaST storage stack from scratch. And they also know it’s still a work in progress. But since there were too many valuable changes blocked by the adoption of Storage-ng, it was decided it was time to push the red button. So we are glad to announce the Storage-ng era has started with its inclusion in the first official (open)SUSE product – starting with snapshot 20180117, libstorage-ng has replaced libstorage and, thus, yast2-storage-ng has replaced yast2-storage. They say forewarned is forearmed, so an article was published in advance in news.opensuse.org to set the expectations and to provide and overview of the current status. We would like to encourage all openSUSE Tumbleweed users to (re)visit the article to get a better picture of the situation. An important part of that work in progress is the re-implementation of the Expert Partitioner with Storage-ng technologies. As mentioned many times in previous posts, this is mainly a 1:1 clone, with the same functionality presented in exactly the same way than the classic YaST partitioner. But some times we take the opportunity to introduce some improvement here and there, as we did this week with a topic that can have a very noticeable impact in the system performance: partitions alignment. Although many people is not aware of it, the partitions in a system must be properly aligned to avoid the performance drop caused by excessive read-modify-write cycles. For details please refer to the great article at Wikipedia explaining the topic, especially the sections titled “4 KB sector alignment” and “SSD page partition alignment”. Moreover, leaving performance considerations aside, some partition tables require alignment to simply work, like DASD partition tables which need alignment to tracks (usually 12 sectors). The new expert partitioner takes all that into consideration when creating and resizing partitions, ensuring always the required alignment (like the DASD tracks) and encouraging the optional performance-related one, avoiding undesired gaps between partitions in the process. Above you can see the dialog for choosing the size for a new partition that, unsurprisingly, looks very much like the same dialog in the pre-storage-ng Expert Partitioner. 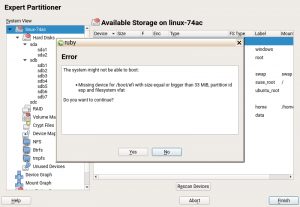 If a size is specified by the user in that dialog (any of the two first options in the form), the start and end of the partition will be aligned to ensure optimal performance and to minimize gaps. That may result in a slightly smaller partition (with the difference being usually less than 1MiB). If a custom region is specified, the start and end will be honored as closely as possible, with no performance optimizations (although mandatory alignment, like DASD tracks, still will take place). 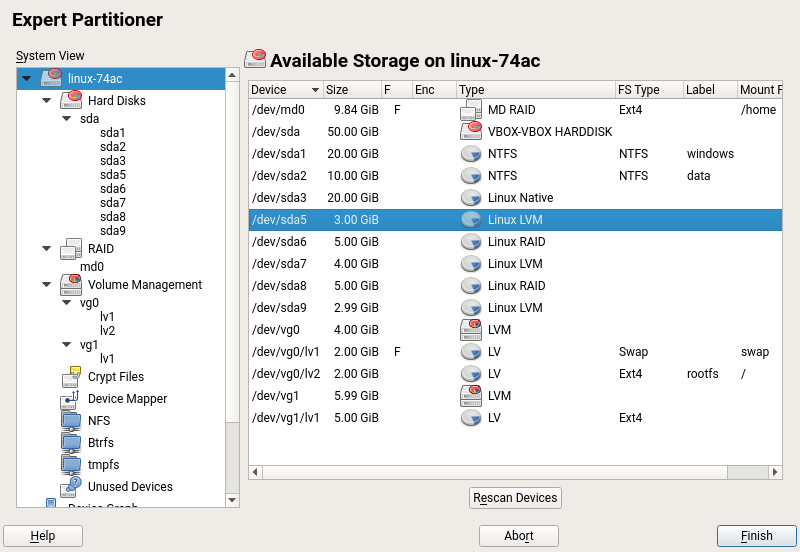 This third option is the best to create very small partitions. The same considerations for optimal alignment will also be taken into account while resizing an existing partition and calculating the minimal and maximal sizes suggested by the partitioner during that process. The possibility of bypassing the performance optimizations in the Expert Partitioner is just one example of the (potentially unleashed) power that tool provides. As a consequence of that flexibility, sometimes the user can overlook some important setup configurations or even make mistakes. To help with that, the Expert Partitioner recovered this week its ability to check the entered storage setup. 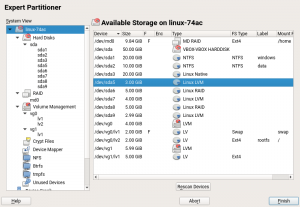 Once the user has set partitions, LVM volumes, file systems, mount points, etc. 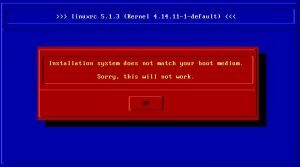 and decides to proceed, the Partitioner will validate that setup to ensure it fulfills all necessary requirements for booting and running the system. 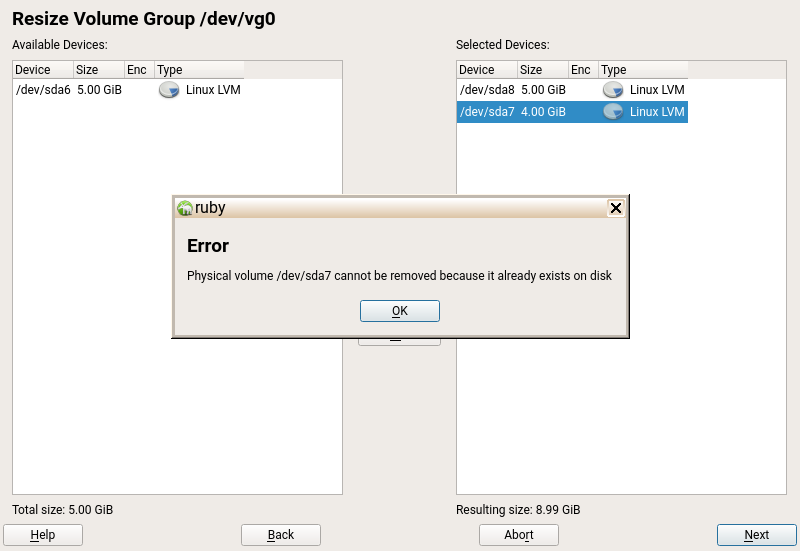 When some issue is detected, a popup message is presented to show what the problem is, offering the option to ignore the warning and move forward. Two kind of checks are carried out to ensure the partitioning setup validity. 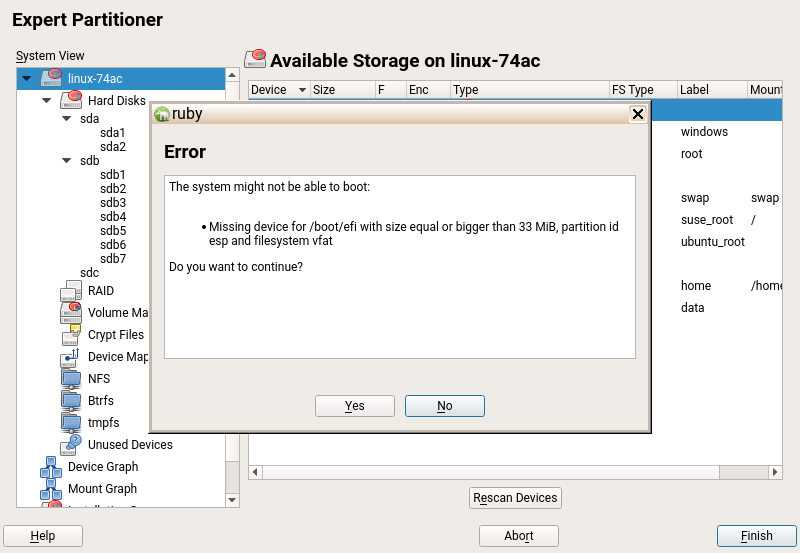 First, the presence of needed partitions for booting is checked. Booting requirements depends on the current architecture (x86, PowerPC, AArch, etc.) and other technical details like the partition table type (GPT vs MS-DOS). Then, the mandatory volumes for the current product are checked. 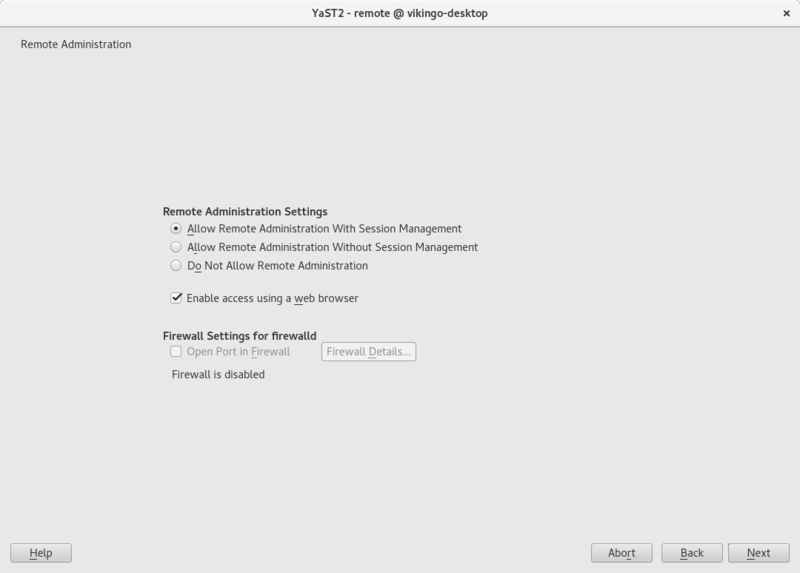 The mandatory volumes are defined in the revamped partitioning section of the control file. 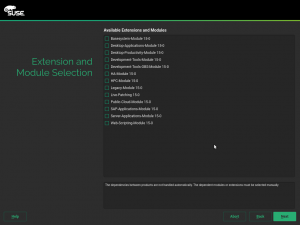 Typically, only a volume for root and another for swap used to be mandatory, but now this is totally configurable by anyone defining the product (SLE, Leap, Tumbleweed, your own custom openSUSE derivative…). As a bonus, all the sanity checks are now centralized (they used to be scattered around the YaST source code) and it’s easier to add new ones (you will miss some old checks at this moment) and to use them from other parts of YaST (like the bootloader module or AutoYaST). The new warnings and the alignment improvements commented above are not the only news on the evolution of the Expert Partitioner clone this week. 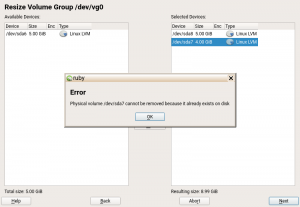 Resizing of LVM devices has also been brought back to life, both for volume groups and logical volumes. In the case of logical volumes, the functionality is not much different, at least in the surface, from the partition resizing that was already present and that you can see in the screenshot of the alignment section. On the other hand, in the context of the Partitioner, resizing a volume group actually means adding or removing physical volumes. Actions that are now possible again, including the corresponding checks. For example, a physical volume cannot be removed if it already exists on disk (that could destroy your data) or if the resulting size of the volume group is not enough to cover all its logical volumes. Apart from the mentioned functionality, there has also been improvements in how the Expert Partitioner presents the information. For example, now the “type” column shows the correct label and icon for each device instead of that useless TODO label. Moreover, similar TODO marks were replaced by proper data in the device overview tab. 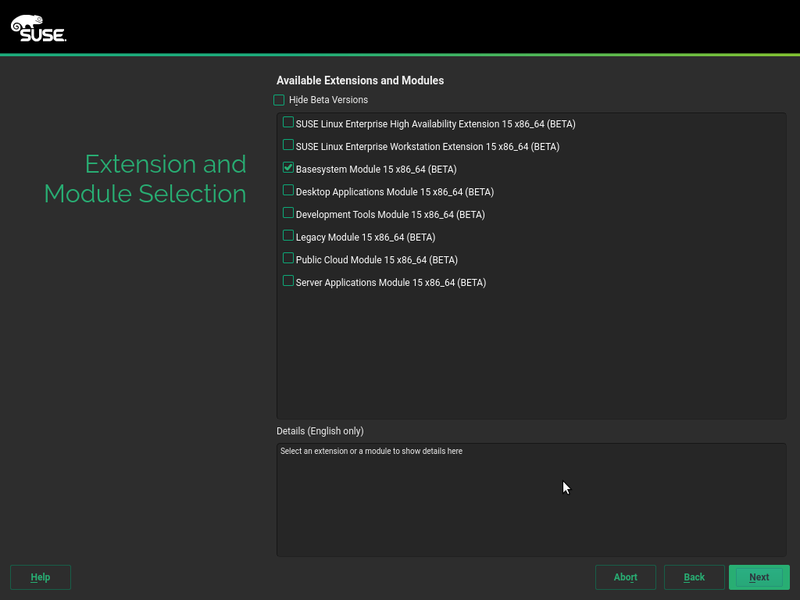 The SUSE Enterprise Server 15 (SLES15) product can be installed from a bootable “Installer” DVD medium which contains the installer and a subset of packages needed for a very minimal system. The other packages are available either from a registration server (after registering the SLES product) or via a separate “Packages” DVD medium. Due to the structure of those DVDs (with some packages being in present in both) the SLES installer was asking the user to change the medium several times during the installation process. Ideally the installer should use all packages from the “Packages” medium without changing the media. 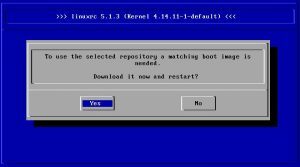 In addition, there is yet another requirement for preferring the packages from the installation DVD to the packages available via a remote repository. Downloading a package from the internet is usually much slower than the DVD and can be problematic in network connections with a download limit or with a price based on the bandwidth usage. Now the installer properly adjust the priority of all the repositories to achieve the desired behavior. To avoid possible side effects we decided to change the repository priority only when more than one repository is used and all repositories are local (e.g. DVD, hard disk, USB flash disk…). That means in some less common cases (2 DVDs + a remote repository) you will still need to change the medium but this is a safer solution. For those using SLE Add On products, we have improved the error message if an Add On Product cannot be added during an AutoYaST installation. The user can see now which wrongly configured Add On Product has produced the error. 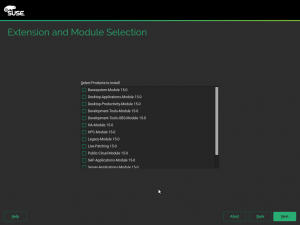 This will be specially useful with the upcoming SLE15, in which the concepts of Add Ons and Modules will become more relevant than ever. And now it’s time for the corresponding dose of technical insights for those who enjoy that part of our reports. When UI::OpenDialog() and UI::CloseDialog() calls didn’t match when shutting down the UI (user interface YaST component), you’d get a segmentation fault with a core dump. Well, you did want to shut down YaST, but probably not like that. This is now fixed. After tracking this down, it was surprisingly simple to reproduce: Just use the YaST version of the trivial “Hello, World” program and comment out the UI::CloseDialog() call. This was a case of providing additional error reporting causing more problems than the original error: leaving dialogs open while terminating the program is an error, of course. But fixing this little problem by cleaning up the remaining dialogs lead to handling widgets after some of the underlying infrastructure (in this case the QApplication) was already destroyed, so all the QWidgets were also destroyed (because the QApplication takes care of that), but YaST’s generic UI layer was still unaware of that fact and tried to destroy them again. This is now fixed by properly cleaning up the widget tree in YaST’s generic UI layer first which will also clean up the associated QWidgets so there is nothing left to clean up for the QApplication. This might also fix a number of similar segfaults in other situations where the YaST Ruby engine would need to shut down because of other problems, e.g. when there is an unhandled Ruby exception. Surprisingly enough, this must have been a very old (10+ years?) bug, but it never became quite obvious, or at least nobody was ever annoyed enough to try to track it down. If you want even more details, check the conversation in the bug report. The end of this sprint caught up with a lot of almost finished stuff. But following the Scrum principle of “nothing is done until it fits the Definition of Done”, we don’t blog about such stuff. Fortunately, that means the next report will likely be quite juicy. So, see you again in a couple of weeks! The YaST team finished its 47th Sprint right before the Christmas break but, sadly, we had not published the corresponding report… until now. The last sprint of the year brought some interesting changes, like Chrony support for AutoYaST, better multi-products medium handling, etc. So let’s recap those changes. 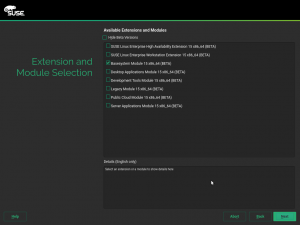 As part of our effort to support Chrony as the default NTP service for (open)SUSE, we have revamped how AutoYaST handles the configuration of such a service. 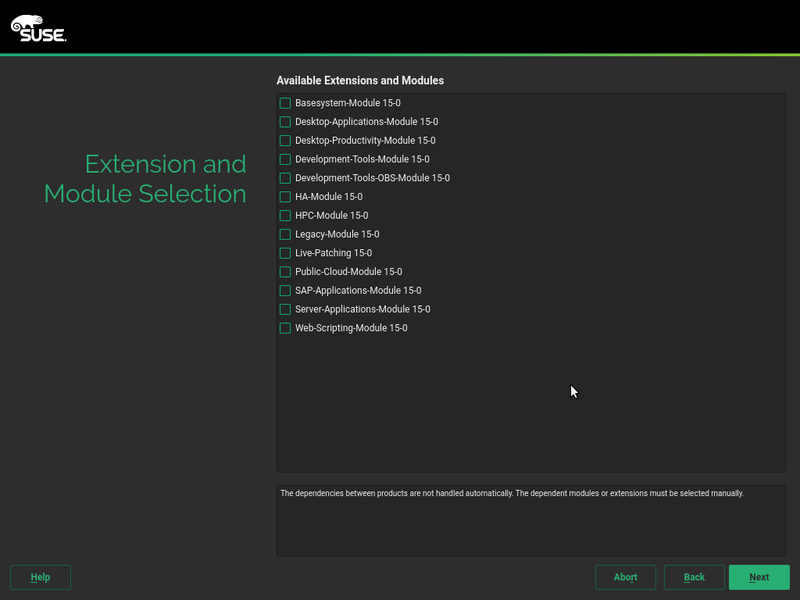 The first noticeable change is that we have redesigned the schema which, instead of containing low level configuration options, is now composed of a set of high level ones that are applied on top of the default settings. During this sprint, the remote administration client has been deeply modified. To begin with, as xinetd is being replaced by systemd sockets, we have dropped that dependency (adjusting the code accordingly). And last but not least, we have seized the occasion to do some code cleaning, reimplementing some dialogs using the Common Widget Manipulation object oriented API. AutoYaST offers a cool feature that allows the profile to be modified during the initial stages of the installation using an user script. So you can run a script which adjusts the profile and AutoYaST will read it again. If you are interested in such a feature, you could find more information in the official documentation. On the other hand, in our previous report, we mentioned that AutoYaST was able again to use multipath devices using the new storage stack. But we didn’t count that it was possible to modify the profile on runtime so the initialization happened too early. Now the bug is fixed so you can again adjust any storage setting using the aforementioned feature. As you may know, some time ago we added a support for the multi-product media (DVDs which contain more than one repository/product in separate subdirectories). This time we fixed some issues regarding this functionality. Originally after selecting several products only one of them was actually selected to install and only one product was displayed in the installation proposal. Fortunately, those issues have been addressed now. As you can see the look & feel is quite different, but from the usability point of view the dialogs should look the same regardless whether the products are added from a DVD medium or from an on-line source (a registration server). The dialog is still not exactly the same, but now it looks more similar so users should feel more familiar with it. 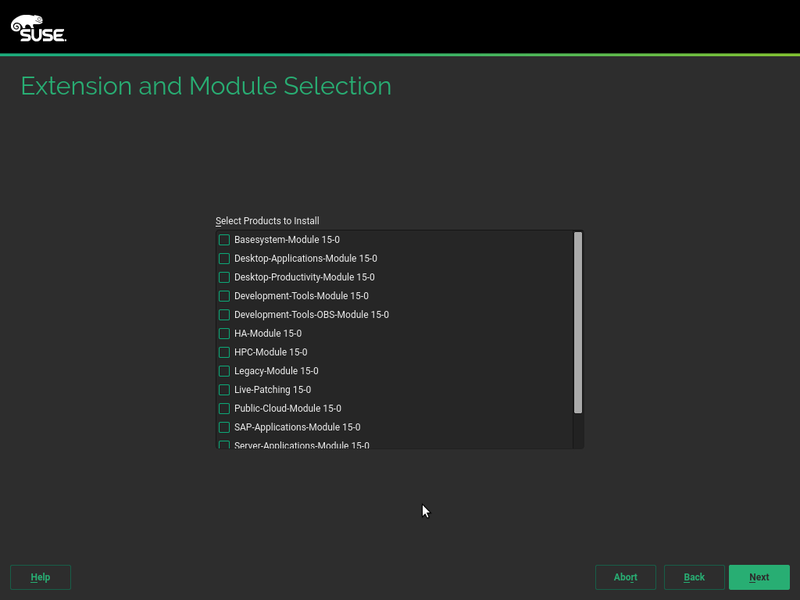 There is also displayed an additional note about not handling the product dependencies automatically. This note was already present in the help text but that is hidden by default. As we got quite a lot of bug reports about this issue we decided to make this fact more prominent. (Note: The dialogs actually cannot look the very same as the DVD media currently lack some information like the dependencies, beta status, detailed descriptions…). We have been using the environment variable called SYSTEMCTL_OPTIONS (which is SUSE-specific) in our systemd services to prevent locks in dependencies. As this hack will not be necessary for upcoming the (open)SUSE 15 version, it will be dropped from systemd and, therefore, we already removed it from our systemd services. When specifying an AutoYaST partitioning schema, you can select which partition type you want to use for each device (MSDOS, GPT, DASD, etc.). In the past, AutoYaST implemented its own logic to select which one to use in case that it was not specified by the user. After this sprint, AutoYaST relies on the new storage stack in order to decide which option fits better when the user does not specify one. Some time ago we had serious issues with service management in YaST (see bug#1012047 and bug#1017166). The problem was caused by introducing a new systemd service state which was not expected by YaST. We fixed the problem by correctly handling the new state. But the main problem was that we (as the YaST developers) were not notified about this major system change and we found this change later after we got bug reports in Bugzilla. To avoid this problem again in the future we decided to implement a script which would regularly check the defined systemd states notifying us if a unknown state was detected. To implement the regular check we use the Travis cron job feature which allows running continuous integration builds not only after a change is pushed into the repository but also in regular intervals, even when there is no change in the code. Alternatively you can use any CI service, but we chose Travis because it is easy to use and we already use Docker for normal CI jobs which allows us to run the latest systemd from openSUSE Tumbleweed in an easy way. So if you also need to run some check scripts regularly you can see more details in this pull request. 2017 was an exciting year with a lot of interesting stuff: a new storage layer, multi-product installation medium, integration of new components (firewalld, chrony, etc.). And it looks like 2018 will not be different and we will have a lot of fun.